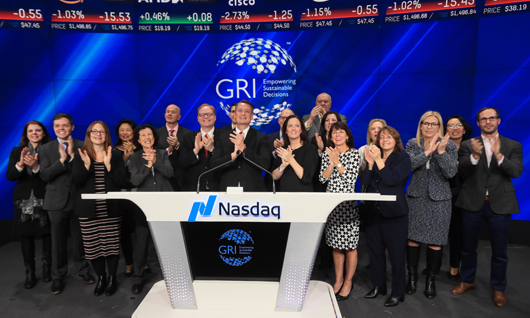 On 20 November 2018, GRI CEO, Tim Mohin, rang the closing bell at Nasdaq, showing that non-financial reporting with the GRI Standards is becoming more relevant to investors in tech and beyond. A quarter of a century ago it would have been almost unthinkable for listed companies to feel obliged to report on their Environmental, Social and Governance (ESG) impacts. Fifteen or 20 years ago, sustainability reporting was a niche topic. This is no longer the case: In 2017, more than half of shareholder resolutions involved ESG information. Investors are now demanding that companies engage in sustainability reporting, so they can have useful and reliable information to assess risk beyond the financial, and beyond the short term. And now the question is no longer whether companies should report, to what companies should be reporting on.